I've been having a love-in with raspberries this summer. Well, berries of all kinds really - but especially raspberries. Raspberries are Mother Hand's favourite berries and in the past I have given them a bit of a wide berth, thinking they were too seedy. They're not. I was thinking of the jam, I think. 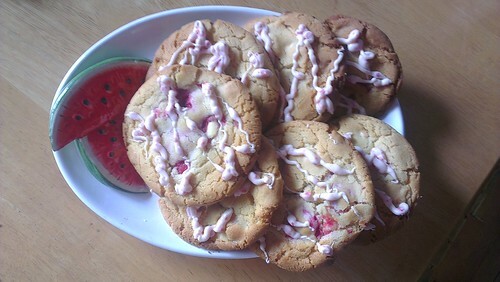 I decided I would have a go at some white chocolate and raspberry cookies. I don't have a regular cookies recipe that I thought would be robust enough for a large amount of filling, so I Googled and found this recipe, which I duly adapted to my needs. Cream the butter and sugar until pale, then beat in the milk and vanilla. Stir in the chocolate chunks. Add the flour and work until you have a smooth dough. 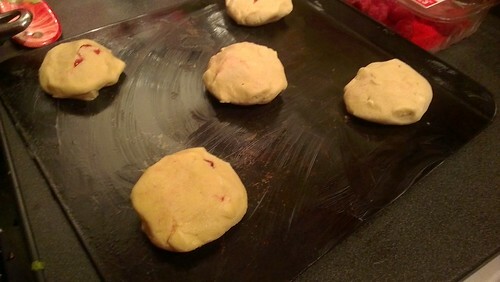 Take a small handful and flatten in your palm; place three-ish raspberries in the middle and then smoosh shut. You end up with something that looks a bit like this. That's a greased baking sheet you're putting them on, in case you didn't realise. Bake at 180 degrees for about 15 minutes until browned at the edges but still quite soft in the middle. Leave to cool for a while on the tray before transferring to a wire rack. I added an extra touch to mine by drizzling with Lindt strawberry white chocolate which I came across in Sainsbury's. I think I can safely say that, while this worked, I really need more practice on the drizzling. I'd like to blame it on the texture of the chocolate but we both know I'd be fooling myself. This made eight large cookies. They are very soft in the middle due to the raspberries. Still warm from the oven they are pretty crisp but then soften up after a few hours' exposure. They are also tooth-achingly sweet. I think, in future, I would not add the chocolate chunks to the mixture but instead stick with a drizzle at the end. I might reduce the amount of sugar, as well, to make up for the sweetened milk. It already has more sugar than I would normally put into, say, shortbread, which is plenty sweet. It's a very good cookie recipe, though. There will definitely be a next time.